Enemy at the Gates! The Giantslayer Adventure Path begins! In the human town of Trunau, a beleaguered settlement surrounded by the brutal orcs of the Hold of Belkzen, the heroes must investigate a mysterious death. Before they uncover the truth, however, Trunau comes under attack by an orc army, and the heroes must help defend it—only to discover that the situation is worse than anyone realizes. For even the fearsome orc raid is just a distraction allowing a giant chieftain to recover the relics of an ancient giant hero from a tomb long forgotten beneath the town. 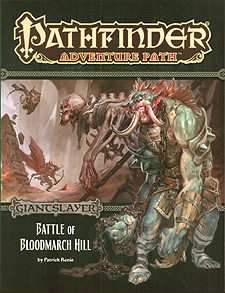 “Battle of Bloodmarch Hill,” a Pathfinder adventure for 1st-level characters, by Patrick Renie. A collection of lore on the behavior of giants, Golarion's largest humanoids, by David Schwartz. A giant bag of feats, spells, equipment, and other rules tailored specifically for giants, by Stephen Radney-MacFarland. An unfortunate gnome's encounter with an ogre family in the Pathfinder's Journal, by Richard Pett. A pack of dangerous monsters, by Tyler Beck, Adam Daigle, and Patrick Renie.